There is nothing fixed to foreign policy. It may vary from state to state as distinctions of interests, govt. system and model of power etc. The first and foremost interest of totalitarian Saudi govt. is to endure monarchy at any cost and to establish itself as a regional power both ideologically and politically. As a result in Saudi Arabia, change of king may alter more or less foreign policy toward Arab world and politics, Shiite communal groups and dominating states like Iran and Syria, affinity and oil policy to western powers especially to USA. Recently Salman Bin Abdul Aziz has become new king of Saudi Arabia. He became king in a period when several problems are encompassing around Saudi Arabia including the Houthis revitalization in Yemen, ISIS invasions and atrocities in Syria and Iraq, strategically emergence of Iran as a decision maker regarding Iraq, Syria and encouraging the Shiite revolutionaries. Besides, few questions such as: will king Salman go to foreign policy reform derailed from ex-king Abdullah? What should be his approaches toward Iran? won’t he be sensitive to Yemenis problem? How he will treat to Abdullah’s core –heart favorite Egyptian president Abdel Fattah Al -Sisi? King Salman is very much conscious and prudent about Saudi Arabian military, economic, strategic and security needs as he conducted various foreign affairs during the period of being governor of Riyadh. However his recent attitude clearly indicates us that he won’t repeat the errors done by his predecessor and he may follow the liberal foreign policy of ex- king Fahd. The stagnant oil price is a major concern of Saudi Arabia to sustain its domestic policies and help to others including Egyptian military president Al-Sisi to rule Egypt. On the contrary, to consolidate power king Salman proclaimed 2 months advance bonus wages for civil service holders, retired govt. officials and students who get state or social welfare scholarship and grant-in-aid also will receive 2 months extra facility. But to do this the king need more money which can only be gained through oil purchasing. Consequently he may change or reduce assistance tactically to Egypt. He may not want to deteriorate the relations of GCC states especially with Qatar and Oman, who are more prone to make alliance with Iran by further supporting Egypt. Besides the absence of Egyptian president in the burial function of king Abdullah and inauguration program of king Salman must impact the matter. King Salman has drastically changed the administrators who were powerful steersman and orthodox especially to Muslim Brotherhood during the reign of king Abdullah. The current king is also showing more affectionate to transnational Egypt based political and Islamic movement cohort, Muslim Brotherhood. He and his political men are intentionally showing a sentiment that they will not take Muslim Brotherhood as a terrorist group. Moreover there has been strong relations between brotherhood and Saudi Arabia in 1950s and 60s period with common interest of antagonism behavior against Egyptian president G. Abdel Nasser. Latter they both tried to reach a peace resolution between two opposing political parties of Palestine named Fatah and Hamas. Saudi Arabia also continued a good relation with Muslim Brotherhood, a well organized and powerful party of Arab world, in latter time to show a close tie within in Sunni Muslims and counter Iran. As Saudi Arabia always wanted to be regional decision maker, Egypt was the main obstacle to it with collateral power. On the other hand all dictators of Egypt were tried their best to debilitate and vanish Muslim Brotherhood who exercised Islam thousands times more than them. As an outcome of these facts a good, reliable and helpful relations constructed between the Muslim Brotherhood and Saudi Arabia. But this relation aggravated early 2010s with the onset of revolution against dictators and tyrants in Tunisia, Egypt and in Yemen. 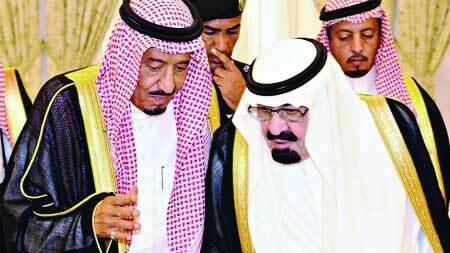 Saudi king Abdullah got worried with these events lest such revolution should arise in his own country. So he took the position against Muslim Brotherhood who was hero of revolution against Hosni Mubarak and where Mohamed Morsi was democratically elected first Egyptian president. Moreover, Morsi was eagerly supported by Iran, Qatar and Turkey. As a result Saudi tensions increased and make strategic alliance with United Arab Emirates (UAE), and Israel to oust Morsi and helped to form military led Al-Sisi regime in Egypt. There is a fact that the majority state conduction related assistance to Al- Sisi was come from Saudi Arabia which is also an irritating matter for domestic people. King Salman may be realized the situation and Al-sisi also knows about the liberal mentality of king Salman and may worriedly not attended the funeral function and installation program of king Abdullah and Salman. Though Saudi mentality toward Muslim Brotherhood has changed by new king, it is implausible to think of fruitful chum relation between them. Middle East’s history is decorated with sectarian fissure between Sunni and Shiite. This rift further deteriorated in 1979 by the origin of Islamic revolution and new Iran. From that period both Iran and Saudi Arabia engaged in an undeclared competition to be a regional power. Latter Iran attempted to establish Shiite rights, collaboration and regime in different countries. So Saudi needed Turkey beside it which is also similar powerful to Iran. But Saudi relation with Turkey collapsed in 2013 when Saudi Arabia directly helped Egyptian military to depose Morsi and making alliance with Israel to establish Al-Sisi govt. Besides now Turkey is ruled by Islamic ideology based political party who is a great vindicator of Muslim Brotherhood. But now Saudi Arabia needs Turkey and Qatar as a reliable friend to stop the Shiite revolutions who are knocking at the door encouraging from Yemen may also enflame in Bahrain next. Consequently Iran will be more powerful and already has shown in the case of Syria. So Saudi Arabia is paying deep and querying heed to its ex allies Qatar and Turkey. It may feasible also to reconcile the relation predicting from the administrative change of running king and their intuitive endeavors. Since deputy crown prince Muhammad Bin Naïf has a strong relationship and understanding with Turkey and King Salman has a convincing relation with Quatrain Amir Tamim Bin Hamad, it can be anticipated that fruitful relations and rapprochement may be possible within them. On the other hand various states showed effective faith to Riyadh with the advent of king Salman. As an illustration we can say about Turkish president Recep Tayyip Erdogan who rushed to Saudi Arabia to commiserate new king and take part in the funeral of ex king. Qatar will also conduct good dealings with king Salman as he escaped Qatar two years ago from relegation of GCC members. Historically there are two reasons behind worst kinship between Saudi Arabia and Iran. Loggerheads between Sunni and Shiite and origination of Iran as a regional counterpart are the two reasons. In 1980s Saudi Arabia straightly supported the Iraqi president Saddam Hussein to attack Iran and turned into deaf ear to the shouts from Iran for help only considering Iran as Shiite country. On that period Iran pledged to be a powerful country and took diverse initiatives to be empowered. Gaining nuclear power is one of them which are also regarded as a tool of regional instability by surrounding states specially Saudi Arabia. However Iran endured itself with much more hurdles coming from USA and neighboring countries. Now with moderate mighty economy, exercising democracy though in short manner, making alliance with great powers especially to Russia, China and India to serve its interest such way Iran is an aspirator to other Shiite factions to emerge with own power. As an outcome Shiite political sects originated and started insurgency against Sunni dominations especially by Hezbollah in Lebanon, Houthies in Yemen etc. which enhances Iranian power in the Middle East region. On the contrary Saudi Arabia takes everything as threat to Sunni and itself. Besides current king Salman has no previous knot with Iran which was with Abdullah. King Salman may think that like prior period Saudi Arabia should intervene into the matter of Yemen owing to secure itself as anything arisen by Shiite group around it may also be enflamed Shiite minorities staying in his country. If Shiite can win in this journey, they must arise in Bahrain which will be humiliation to Saudi Arabia. So there have less opportunity to peaceful relation between Iran and Saudi Arabia though it is must for regional stability. But Shiite insurgency in Yemen and Iranian undaunted validation of Syrian tyrant regime, nuclear energy of Iran, Saudi interference in Yemen, Saudi Wahabism are chief trammels between development of relation within Saudi Arabia and Iran. Dealing and conduction with Iran as an OPEC country about oil price procedures, ISIS problems as both are bordering country of Iraq and regarding resolution for Palestine may open door of foreign tactical relations of Saudi Arabia with Iran. Saudi new king Salman may attempt best to keep United States of America beside it to eradicate all roots of insurgency from this region especially that engender interruptions to its position. On the other hand US president Barak Obama’s attendance in Saudi Arabia in the funeral of king Abdullah cutting India tour short is also a signal from USA that how much it pays emphasis to Saudi Arabia. The US Senator John McCain, head of a seven-member group of American Republican senators, visited Saudi Arabia recently who received with warm welcome also a gesture of intimate relation. King salman sought to further improvement of relations between Arab countries and USA creating assumptions that he has pro-western tendency and wants to maintain good relation with longstanding partner USA for their national interest. But the issue of ISIS, finding new linkages of Saudi royal family in 9/11 incidents, changing behavior to Israel and recent assault of Al-Qaeda in France’s Charlie Habdo may create some obstacles to this relationship. Any kind of foreign relations and policy of Saudi Arabia may only be taken to amplify it’s all sort of security and consolidate position as regional power. It may show flexibility to Muslim Brotherhood but it does not guarantee a useful and faithful relations. On the other hand accomplishment discussion of nuclear energy between Iran and USA is may seen by Riyadh in askance manner whereas exaggerated Saudi dependence on USA only for safe throne is a matter of creating negative remarks by Tehran about Riyadh. But appeasing relations with Turkey and Qatar may be set up by king Salman. Therefore, there are clear indications that new Saudi king may change tactical foreign policy issue for his and country’s betterment such as being malleable to Muslim Brotherhood or Iran. But strategic foreign affairs like close tie with USA may not be changed in a little bit.